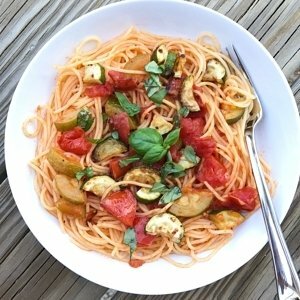 A simple pasta dish that showcases the some of the best of summer produce. This is one of our favorite quick and easy summer pastas. Farm fresh diced zucchini and tomatoes sautéed in with lots of garlic and EVOO, seasoned with salt and pepper, then topped with fresh basil. That’s it! It takes about 30 minutes from beginning to end and every bite tastes like summer. A quick and easy pasta dinner that showcases summer produce. Add zucchini and cook for 7- 10 minutes or until starting to soften, stirring occasionally. Add tomatoes and tomato paste and cook another 8-10 minutes or until both zucchini and tomatoes soft and tender. Meanwhile prepare spaghetti according to package. Note, sometimes I will add the cooked spaghetti directly to the saute pan with zucchini and tomatoes and gently combine before serving.